Earlier this week we returned from the Sonnenberg Arts at the Garden in Canandaigua, NY, a very well organized arts festival in the Finger Lakes of New York state. No matter the organization, which here was outstanding, and no matter the size of our booth spaces which here was a generous 15′ x 15′ for our 10′ x 10′ canopy…..things out of the control of humans can still make a festival difficult. This was one of those years! Our arrival on friday around noon was accompanied by 90 degree heat. As we always do, we unloaded the canopy poles and canopy off to the side for ease of construction. By the time we had the car unloaded and started to assemble the canopy, we could not touch the poles!! There were scorching hot from the sun! 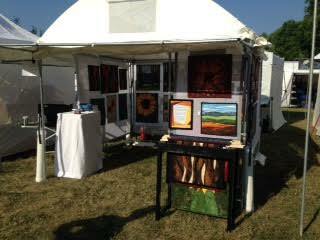 This was the beginning of a very slow set up due to the heat. Over 3 hours later for a task which is usually a scant 2 hours, we finished and headed to our AirBnB, home away from home for the next 3 nights. The first day of the festival was 90 degrees. There were easily 50% fewer attendees which meant 50% fewer customers. The day was forecast to be hot but not raining which meant we were a bit surprised in early afternoon when the first of several showers came through. Gentle showers were manageable. The heat was such that I did not want to put down the canopy walls unless absolutely necessary which happened with the third blowing, torrential rain shower! There was no dashing out and back in as my tasks to drop the walls and zip the corners resulted in being totally soaked as though I had jumped into a swimming pool. Luckily my husband came quickly with dry clothes so we limped through the rest of the hot, steamy afternoon. Sunday started with heavy blowing rain for over 2 hours….there were almost 2 hours I had the front of my canopy completely closed. There were no customers until close to noon when the rains let up. Attendance was about 20% of normal on Sunday when it finally stopped raining for good around 3pm. We packed wet and dried out at home. The most challenging part with quilts was the humidity and having one of my walls of quilts get quite wet from the blowing rain saturday when my walls were still rolled up. This was an UGH!!! kind of event this year which is disappointing as it has been one of my best festivals. 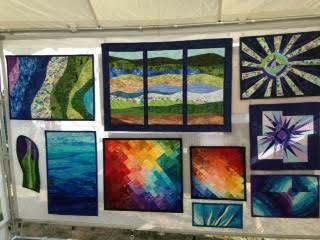 I sold only 5 quilts, all fairly small. People were reluctant to purchase fabric art in the rain even though I had tubular plastic with which to wrap all purchases. Festival experiences like this, with expenses beyond sales and conditions way too challenging for me, certainly make me start to think about whether I want to continue the festival sales circuit. I am thankfully done with outdoor shows this year….I will have to decide soon about next year’s festivals. I love so much about meeting customers face to face and the enjoyment of talking with other quilters and finally the very personal feedback you get from customers at festivals. It will be a hard decision for 2017.